As per the government norms, a daily allowance is a uniform allowance that shall be granted per day of absence from the headquarters. This shall only be provided to the government employees who are absent from the headquarters for a specific period of time. Also, the traveling has to be beyond 25 kilometers (from the headquarters) to avail this benefit. Since daily allowance is the cost that would reimburse the employee if he has gone to stay outside, the only eligibility that you need is to be a government employee who is working away from his hometown. To avail the DA, you must provide a self certified claim. Your claim should indicate your period of stay. The rates of the daily allowance vary widely as per the Grade Pay. These usually increase with the class of cities that the person lives in, with the Class A cities having the highest Daily Allowances since the traveling costs in these places are higher. No demands have been received in terms of the traveling DA. Therefore no changes have been made in this category. The commission is of the opinion that the present provisions under this allowance are enough. At present the traveling charges are being calculated as per the journeys on foot, taxis, food bills and accommodation/ guest houses. If you are on tour or travel, then the daily allowance will be calculated per the number of days of absence from the office – from midnight to midnight. If you are absent for more than 6 hours but less than 12 hours from your office then you are eligible for 70% daily allowance. In case of an absence of 12 or more hours from the office, you are liable to get full daily allowance. If you are free boarding and lodging you will get 25% of the DA. If you are lodging alone then you will get 50% of the DA. If you are accommodated in the office building you will get 75% DA. There’s also a mileage allowance, which is given to meet the cost of traveling during office hours for a job that requires one to travel. If a government employee takes a route which isn’t the shortest, but is actually cheaper than the shortest, then the amount spent on journeying this route will the amount of DA that will be provided. According to a section 10 (14) under the government norms, Daily allowance is fully exempted from tax. This means that the amount that you receive as the daily allowance shall not be liable to go through tax. 1 Daily Allowance Policy As per the government norms, a daily allowance is a uniform allowance that shall be granted per day of absence from the headquarters. 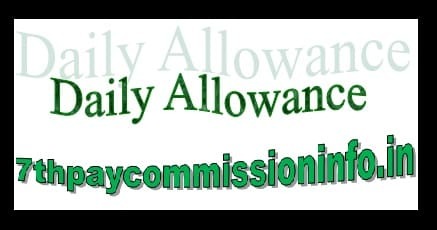 2 Daily Allowance Eligibility Since daily allowance is the cost that would reimburse the employee if he has gone to stay outside, the only eligibility that you need is to be a government employee who is working away from his hometown. 3 Daily Allowance Rates The rates of the daily allowance vary widely as per the Grade Pay. 5 Daily Allowance Calculation If you are on tour or travel, then the daily allowance will be calculated per the number of days of absence from the office – from midnight to midnight. 6 Daily Allowance taxable or not According to a section 10 (14) under the government norms, Daily allowance is fully exempted from tax. This means that the amount that you receive as the daily allowance shall not be liable to go through tax.